Birds build a nest to lay their eggs in and to safely hold their growing brood until they fledge. There a many ingenious nest designs which range from delicate cups of woven moss, lichen and spider webs to nests made from mud or simply a hollow on the ground – not all birds nest in trees! Here are some intriguing investigations to learn about this busy and important time in a bird’s life. I-spy a bird’s nest: Each species of bird has a characteristic nest style. Look for old nests built last year in mature broadleaf hedgerows before they leaf up, and whilst the silhouette of the nest can be easily seen. Blackbird nests are large and robust as they use a layer of mud to hold the cupped shaped nest together, making them easy to spot. Lower down in a hedge or close to the ground you might be lucky enough to discover a robin or wren nest carefully hidden amongst climbing plants or log piles. Their nests, using moss and dried leaves, perfectly blend into their surroundings. Also look up high in trees to spy rook and crow nests; they use large sticks to build an untidy looking cup shaped nest usually where a branch meets the trunk. Is it a nest? 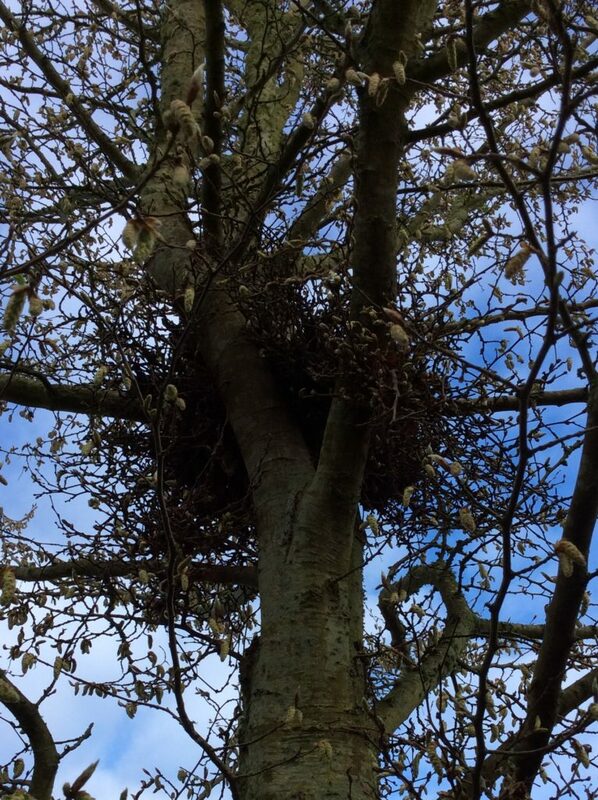 Often nests can be mistaken for mistletoe, an evergreen parasitic plant that grows on broadleaf trees such as hawthorn and apple, or a ‘witch’s broom’ an abnormal woody growth that looks like broom or birds’ nest. Remember it’s illegal to disturb active nesting birds, so only collect and study nests that are obviously old and deserted. I have small collection of windblown nests and a wren’s nest that I found in the autumn when cutting back bulrushes in a pond. Groups can then look up close and really appreciate the variety of nest designs; shape and size, what materials have been used? – moss, lichen, feathers, sheep wool, horse hair, dried grass and how these materials have been woven together by birds to create nests that are strong, cosy and often perfectly camouflaged – amazing! Tip: Old nests are fragile, so I put them in small shoe boxes for groups to view. It also avoids having to wash hands afterwards – nests are full of bird mites. Feathering the nest: Birds are careful about approaching their chosen nesting site. You will notice them stop, to check they are not being watched, before they secretly disappear. Looking at the right moment, you may see them collecting material or see where they are nesting. Blackbirds and song thrushes collect mud to line their nests, so by a muddy patch in the garden or by leaving out a ready mixed tray of soft mud, you might observe birds collecting the mud. Sparrows like to nest undercover in roof spaces and under eaves. It’s easy to leave out some loose piles of hay and straw to attract sparrows – their favourite nesting material – then watch where they go. Fun detective work but watch from a distance! 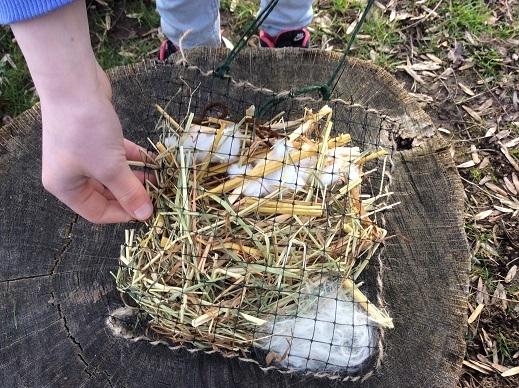 Similarity you can also make a nesting material bag stuffed with a wool, mohair and hay to encourage birds to visit your garden to collect suitable nesting material and watch where they go. In the New Forest look out for jackdaws pulling out loose winter hair from ponies and cattle to line their nests. A helping hand: Often there is a shortage of suitable nesting sites so install an artificial nesting box. Maybe choose a box design that will attract an uncommon bird species that visits your garden. Add a nest box camera. Remember to clean out last year’s boxes to reduce mite infestations and you’ll also have a strange square shaped nest to intrigue your groups! For all enquiries please call Sally or use the contact form.